I’ll be eligible for social security and senior discounts and ride the bus for next to nothing. For many years I thought 65 was the signpost leading toward the end of life. Yet here I am: fit, vigorous, working hard, energized, and feeling not at all old. That is how I see myself—I have no idea what other people see. Do they see a little old guy who they ought to give up their seat to? 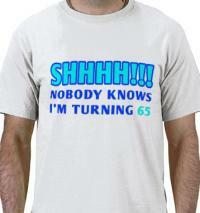 Clearly my 65th birthday is different than my parents’ 65th birthdays or did they feel the same way? Over the years our concept of work at this age has changed along with our expectations of our level of physical activity. I look ahead to another 20 productive years—teaching, writing, holding workshops and talks, and traveling. Why do I work at all? Am I afraid to stop as some of my friends say? The milestone “retirement” as the end of work has no allure. Yes, I could stop working and live a modest life, but what would I do? The dichotomy between work—doing things to support a “real life” outside of work—and leisure no longer fits. I don’t have a “real life” separate from work—my work and life are tied together, linked with my wife and family who share many values and interests in what we do together. Going to a conference or working on a client project is both a wonderful way to view the world. Life is not punctuated by time-on and time-off, but it’s a journey across many terrains. But my work today is not the same as it was when I was younger. Striving for achievement and advancement is largely gone. I’m not looking for acclaim or promotion, but rather to find satisfaction and offer service by doing what I have learned to do well. Work is my way of being in the world and my pathway to experience it. There is no more up—just around, through and across. Related to this is a freedom from feeling thwarted or bothered by the success of others. I have the luxury of genuinely feeling delighted to see others move forward. I think that comes from the protoypical experience of seeing my kids succeed. Their success is mine as well. That extends to students and friends from many stages of my life who have gone on to do great things in their lives, and those who struggle to overcome adversity. I love them all and what they have done. I don’t compare them to me any more. We are all unique. I see time differently. I don’t look ahead much to long-term goals. Things are more here-and-now. When I think about something I want to accomplish in the future, I ask myself: What future? I want to travel more and must make time each year for that rather than look far out to a mythical future. The other direction in time is more startling. I look back consciously over more than a half century! When something happens, I recall many similar events and look for patterns and reflections. When I see someone tout a new management theory, a new paradigm, a fifth wave, or a great transformational experience, my mind goes back to hundreds of other times when my friends reported life-changing experiences. Can we truly be transformed every year or so, or is transformation something like a turning point that happens just a few times in life? I now see that we can’t judge if something is really transformational without perspective, which takes time—it doesn’t happen overnight. I see more things as similar than different. A new model of leadership? That sounds to me like one from a previous decade. A deeply transformational workshop? Been there and done that, many times. This isn’t a cynical attitude. I am deeply respectful of people’s experiences—I just know that I have a lot of it. I try to share it as needed—not by dismissing others, but by asking them challenging questions about where they go from here. That is what being a teacher is all about for me. From my perspective, change is very hard and even rare—a long journey with hard work rather than a fortunate, deep, intense experience. You have to move from what you see to what you do. I find myself relating differently to other generations. I have a new fondness for the younger generation even though I know that I will never really understand them fully. They live in a different world with different skills and minds. I no longer think I can be just like them. I listen and offer the benefit of my experience in the hopes of being helpful. I find that when they see that I am not trying to change or mold them, they feel respected and are open and willing to listen. By doing this, they share things that add to my life as well. With elders, I am a peer and I finally able to challenge denial, hurtfulness, and self-defeating behavior because I can approach them as one imperfect being to another. Those in the prime of adult responsibility, I can mentor and help them try to do better than our generation has done with the deep challenges that we have left for them to deal with. This legacy keeps me from feeling even a little bit arrogant or superior. We are a deeply fallible species and our future is far from assured. Another element of maturity to me is a tendency to be less judgmental and more open. When I was young, there were bad people and people like us who were good and pure. Not so today. I can look back over deeply felt visions and see outcomes that were not what we imagined. “If we ran the zoo…” we used to envision we could accomplish great feats. Now we run the zoo—or ran it—and our performance is not so hot. Knowing that, I find it hard to judge other people as bad, wrong, or poor intentioned. I disagree actively with lots of people–many of them in positions of power–but my approach is to wonder why they think that way. I engage them by saying that I don’t understand how they can act the way they do and try to figure out why. I look for leverage to convince them; not raw power. Over my now many years, I feel less sure of what I know rather than more sure. I know a lot, but what I’ve learned hasn’t provided me with more certainty. I talk a lot to my elder friends and one thing we have in abundance is cannyness. I loved it when my martial arts teacher told me that the trickery and treachery of old age will always beat the talent and strength of the young. Part of this comes from living our lives facing increasing cognitive deficits. We have trouble hearing, seeing, remembering, walking and staying awake. Adversity of this sort makes us clever and tricky. Us elders also spend a lot of time comparing deficit stories and how we cope with them. We all know what to do in a meeting when we don’t know who exactly the other person is who is greeting us. We know how to be up to speed in a conversation where we hear only every third word. We read patterns, look judicious, and check things out as we move forward. We can make asking a question look smart rather than covering a deficiency. We are clever because we have to be to survive. Brute force is over for us. What is the goal and purpose of our lives at this stage? I think of it as a combination of living in the here and now, doing what we do well and enjoying it, being satisfied with what we have, and thinking about how to manage a good completion of our lives. Now is the time to undertake unfinished business. To look at the people around us and do good by them. With the difficulties we face, I hope that there will be a productive use of what we have learned for the remaining 20 or so working years of our lives. I want to contribute not just take. I have given up expecting to be celebrated—though I would like a little respect for my frailties—but I do want to be valued. I have heard that elders envy the young. I don’t, really. It is hard to expect a better life for our children and I find myself just hoping that they can find good work, start a family, and survive. It is so clear that our generation was more than a little profligate in the way we lived. For that reason alone, I don’t feel like after all the work I have done, the next generation owes us something. I think sometimes I work because I know they don’t owe me anything—rather, we owe them. We owe them the fruits of our maturity and the help to make a better world. Elderhood. It is something that changes every generation; something that we have to invent as we go along. Something to savor and share with my friends at our upcoming 45th college reunion. But it far from the end of the road.